Powers/Abilities: Able to creep up walls and slower than a three-legged tortoise. He leaves a snail-trail behind him as he walks. 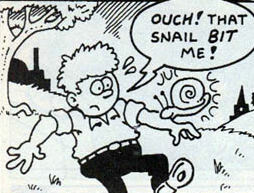 History: After being bitten by a snail, young Percy Perkins gained the powers of a snail and decided to design a costume and fight crime as Snail-Man. Comments: Created by Lew Stringer. 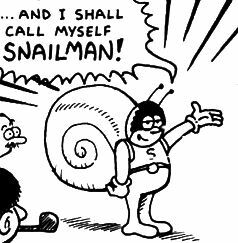 Snail-Man's strip ended with Spidey Comic #653, after twenty installments (including #650's team-up with Captain Wally, where they shared a strip).